For most people, retirement is a time to slow down. A time to put your feet up and relax and enjoy the comforts of life. But not everyone feels that way. When I heard about a couple in Wellington, who are using their retirement to explore New Zealand, and are doing so not in a comfortable motorhome or caravan as so many others do, but on foot and in a tent, I was intrigued. Luckily, the two agree to meet with me and to tell me about their big adventure. A few years ago, with retirement approaching, Liz and Alan Martin started to think about what they might want to do with the new-won freedom. Having been enthusiastic hikers for many years, their friends and family probably weren’t surprised to hear that the retirement plan would involve tramping. However, they might have been surprised by the trail Liz and Alan chose. Following a bold ‘go big or go home’ attitude, they decided to walk the Te Araroa trail which starts at Cape Reinga in the very north of New Zealand, crosses all the way through both main Islands to end at The Bluff at the very south of our beautiful country. 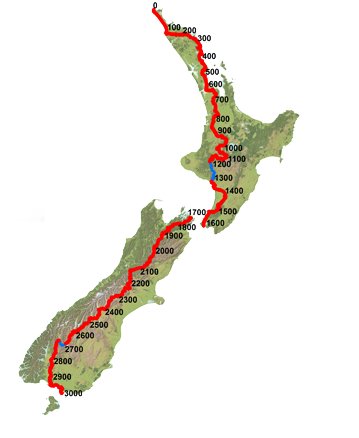 The trail is over 3,000km long and covers the whole variety of New Zealand; Beaches, mountains, bush, forest, cities, towns, lakes, volcanos and much more. The first part of the trail, Kerikeri to Waitangi, was opened in 1995 and the full track was completed and opened in 2011. Since completion, the track has been growing in popularity each year, with over 550 people walking the whole length during the 2016/17 season and about 1,000 expected to start this summer. Learn more about the trail here. Walking the trail end-to-end in one go takes about 5 months. But more and more people also do what Liz and Alan did and break it up into several sections of a few weeks each. The majority of Te Araroa hikers continue to be international tourists, but more and more Kiwis are also discovering the trail for themselves. However, kiwis or internationals, hardly any are in their 60s when they attempt the hike. The track is not only long but includes several steep climbs and descends and other tricky sections. Needless to say, it would be a challenge for most of us, no matter what age. But Liz and Alan were ready for the challenge. So in early 2017, they made their way north to Cape Reinga and, as Liz puts it “struggled down 90 Mile Beach”. Slowed down by a bad cold, Alan’s sore hip and blisters on their feet, and with the initial beauty of 90 Mile beach quickly turning into seemingly endless monotony, their adventure was not off to an easy start. But they kept going, and after a few difficult days, things started to get easier, and they found their rhythm. Six weeks after leaving Cape Reinga, they ended the first leg of the journey in Auckland. After some well-deserved rest and re-charging back home in Wellington, and after waiting out winter, Liz and Alan continued their Journey in November 2017, walking from Auckland back to their home in Wellington. They split the leg into two parts, doing 4 weeks before Christmas and another two weeks in the New Year and also admit to “cheating a little at times” by hitch-hiking when the trail would go along roads, and the walk is less enjoyable than the forest, mountain and bush sections are. But if you ask me, even with the occasional ‘short-cut’ walking from Auckland to Wellington in 6 weeks is quite an achievement, especially for two people in their 60s (I’m not sure I could do it). 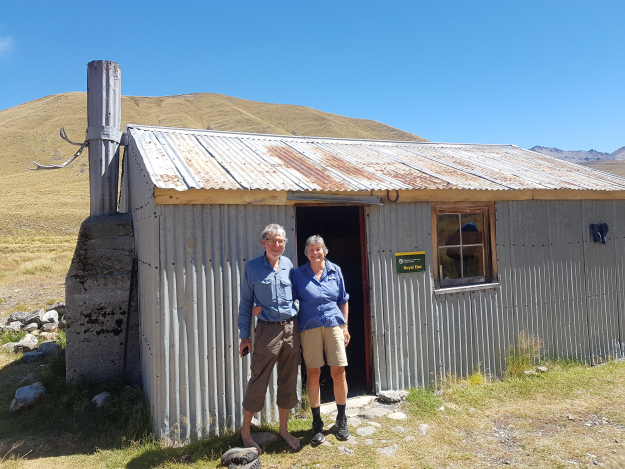 After waiting out another winter, Liz and Alan set out to tackle the South Island in November last year, making it all the way from Picton to Lewis Pass within a month before Christmas and then continuing for another month from there to Ahuriri River earlier this year. They are planning to head back south at the end of this year to complete the trail all the way down to Bluff. They both agree that the South Island was the best part because of the beautiful scenery. But it also came with many challenges including snow-capped mountains, difficult to cross rivers and streams and steep climbs and descends. Liz admits there were a few parts of the trail that made her quite nervous. But she didn’t let that stop her. The South Island is also a lot more remote than the North Island with long distances between towns, which meant they had to carry more food and supplies with them. But it’s precisely this remoteness that makes the South Island section of the track such a fantastic experience. Their little tent in which they spend many nights during the hike. After having spent more than 20 weeks on the trail, Liz and Alan have a well-set routine. They get up, make their breakfast and then walk up to 8 hours each day before setting up camp for the night in DOC huts or campgrounds along the way, or by simply pitching their tent behind dunes or in the bush when there is no campground around. In the evenings, Liz writes the blog post for the day while Alan looks ahead and plans the route and destination for the next day. Occasionally they splurged out on the comforts of a cabin but that was the exception, most of the time they made do with the very basics. Not surprisingly, a long journey like this is not without challenges. It takes a lot of determination to keep going every day, especially when you’re tired and exhausted, it’s raining, and the finish line is still a long way away. When I asked the two what it was that kept them going when things got tough, Liz says “it was strangely addicting. And I knew if I would go home, three or four days later I would wish I was back on the trail”. Neither of them ever seriously thought about quitting. For Liz and Alan, tramping is part of who they are, as individuals and as a couple. They met through the Tararua Tramping Club and have always enjoyed being out in the bush together. Alan says hiking gives him a “sense of being independent and self-sufficient”. He likes being out in the bush, carrying all his gear and being able to survive for several days or even weeks completely on his own. He says it makes him feel alive and gives him a real sense of appreciation for his health and well-being. Liz agrees and adds that she really loves and appreciates the solitude out in the bush and the sense of calm it gives her. And of course tramping is a great way to see the country and it gives Liz a sense of pride that, as a Kiwi, she can really say she’s seen her country. Both also love how tramping, especially when you’re on a long trail like Te Araroa, is a way to really be in the moment for several weeks and to push the worries of everyday life aside for a while. They explain that when you're tramping for multiple days, life is simple. You get up in the morning, you eat, then you walk for several hours, before you set up camp, make some food and sleep – and then repeat the whole thing the next day. You have to deal with challenges on the track as they come up, but there is no point in worrying about them in advance. As Alan puts it “there is no need to keep to-do lists, and you don’t have to worry about forgetting something. Life is simple, and its all about being in the moment. There is nothing to forget”. Another aspect they really enjoyed about being on the Te Araroa trail is the community around it. Even though they stood out a bit due to their age, they connected with many amazing people, exchanged stories and motivated each other. While they would walk on their own most of the time, they say you often meet the same people again at the hut and campground, and you start forming amazing bonds over the shared experience. Walking the Te Araroa trail has been an amazing experience, and Liz and Alan are starting to feel a bit sad that the journey is soon coming to an end. It’s been their big project for the last two years. They’ve learnt a lot from the experience, and it has given them a lot of meaning and purpose, which they consider a crucial ingredient to a happy life. But sad as they may be that their Te Araroa adventure is coming to an end soon, they are already thinking about the next big tramping project they want to tackle, and I don’t think we will see these two retirees slow down any time soon. At one of the many huts on the South Island.